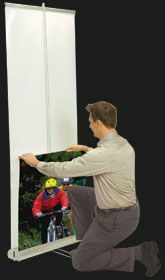 This high-impact, visual display is ideal for tradeshows, conventions, lobbies, malls, and retail environments. Its compact footprint and portability make it ideal for many uses. Banner, poles and feet are protected and stored inside the canister base. Unit is made from anodized aluminum with silver finish. 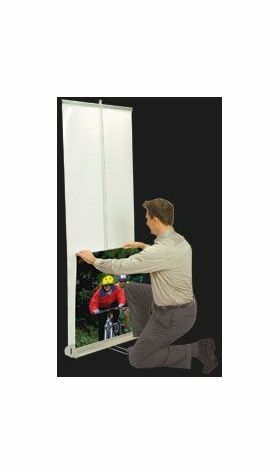 Available in single or double sided configurations and three sizes. Pricing "With Graphics" includes full color (glare-free) laminated graphic(s). Your graphic is pre-installed in the display for you. Includes a soft travel case.